In biology, "symbiosis" refers to two organisms that live close to and interact with one another. Astronomers have long studied a class of stars — called symbiotic stars — that co-exist in a similar way. Using data from NASA's Chandra X-ray Observatory and other telescopes, astronomers are gaining a better understanding of how volatile this close stellar relationship can be. 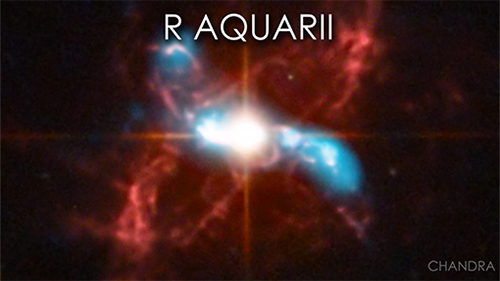 R Aquarii is one of the best known of the symbiotic stars. Located at a distance of about 710 light years from Earth, its changes in brightness were first noticed with the naked eye almost a thousand years ago. 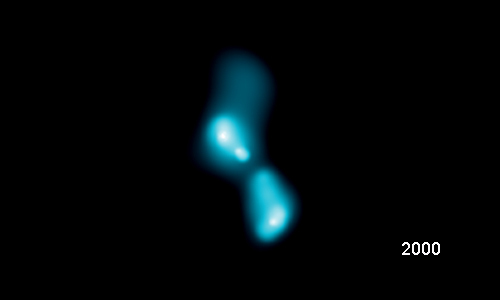 Since then, astronomers have studied this object and determined that R Aqr is not one star, but two: a small, dense white dwarf and a cool red, giant star. Occasionally, enough material will be pulled from the red giant onto the surface of the white dwarf to trigger thermonuclear fusion of hydrogen. The release of energy from this process can produce a nova, an asymmetric explosion that blows off the outer layers of the star at velocities of ten million miles per hour or more, pumping energy and material into space. Since shortly after Chandra launched in 1999, astronomers began using the X-ray telescope to monitor the behavior of R Aquarii. Chandra's data have provided new information about the details and timing of the explosions that occur in R Aquarii. Continued close monitoring of R Aquarii with Chandra and other telescopes in the future should give scientists more insight into this unusual stellar system. R Aquraii is an unusual star system located about 710 light years from Earth. 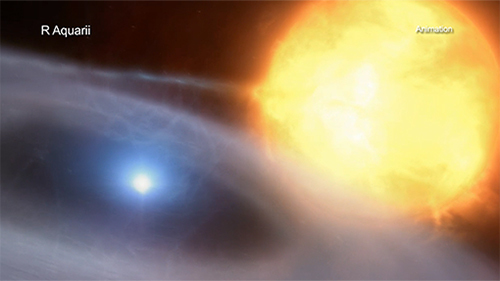 It contains a white dwarf in orbit with a pulsating red giant star. Because of differences in temperature and gravitational strength, the white dwarf pulls the outer layers toward it. Occasionally, enough material accumulates on the white dwarf's surface to trigger a thermonuclear explosion. Scientists using NASA's Chandra X-ray Observatory have been studying these explosions. They are learning just how complex and volatile this stellar relationship can be.